This week we use empirical evidence to determine that Araki was an X-Files fan. We wonder what the hell Jotaro is drinking on the beach. We discuss effective ways to teach number theory. 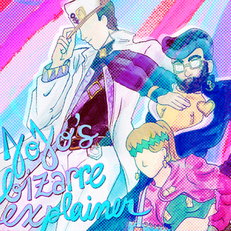 We gush over the best ever JoJo's opening credits. And we once and for all settle the question of whether Mikitaka is a stand user or an alien. Spolier: the answer involves yeast.